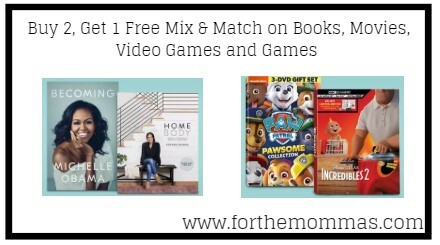 Target has Buy 2, Get 1 Free Mix & Match offer on Books, Movies, Video Games and Games. You can choose from All Movies, Kids Games, All Books, Kids Books, Kids Movies, Video Games, Board Games and more. Discount will be applied at checkout. The lowest-priced item will be free. Make sure you add all items to cart to receive discount. This offer is valid till 16th Feb.